What's more exciting than the World Series? Yes, there's the obvious. The women's long distance runners in the New York City marathon. Duh! But there's also the NJ governor's race. According Mystery Pollster, the polls are showing a dead heat. He says 42% for Christie and 42% for Corzine. Why the hell is this so close? Christie, for God's sake, is from the Sarah Palin wing of the Republican party. He wanted to turn back the stimulus money from Washington. He'll slash social services. The corruption scandal in New Jersey among Democrats really killed Corzine. 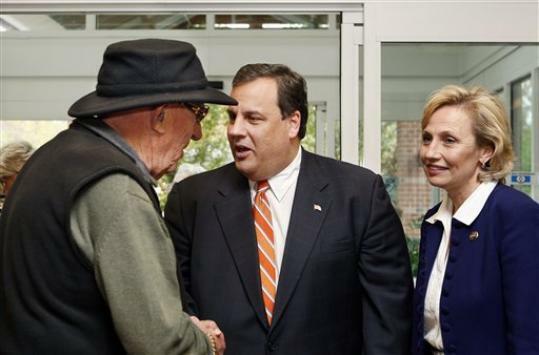 Yes, the Democratic Party in New Jersey is super dirty. They've got my people, the goombas in Hudson County, taking care of their pals. But the Republican party in New Jersey isn't much better. New Jersey is one of the most corrupt states in the country, after Rhodes Island and Louisiana. Christie is part of this same dirty system. Taxes in New Jersey are just awful. In some middle class communities, people pay as much as $15,000 a year just in state and local taxes. Although Christie says he'll do something about the taxes, he's really not going change things. We have high taxes in New Jersey, because we put more into education than other states. We also have really, really small little towns that each have their own fire department, police department, library. Each superintendent makes $200,000. Corzine tried to get the towns to consolidate, but it's an unpopular idea. People in New Jersey identify more with their local towns, than with the state as a whole. Taxes are also high in New Jersey, because we have a bunch of post-industrial cities with a great deal of poverty. There's Elizabeth, Jersey City, Camden, Paterson. They require very expensive social services, which up the state tax. Christie isn't going to be able to make those cities disappear. The unions are also very strong in New Jersey. State employees get paid a lot here and have generous compensation packages. That also raises taxes. But the contracts have been negotiated; Christie isn't going to be able to change them. While people in New Jersey are rightfully pissed off about corruption and state taxes, they could end up voting for the wrong joker. It may be completely rational to not vote, but you should still go out there anyway. I already voted. I let my son push the buttons because I enjoy screwing with the poll workers. I say “You can pick that guy or that guy, whichever you want” and the workers can’t see that I’m guiding his finger to who I want to vote for. I hate the new machines that try to make sure you vote in every contest. I deliberately skip 90% of the ballot. I enjoy screwing with the poll workers, too. In our town, they’re all old Republicans. So, I take the kids into the voting booth, pull the curtain, and then loudly tell them to vote for the Democratic candidates, because the Republicans are evil, mean people who hate children. I also miss the actual voting booth with a curtain. We just have a couple of screens to the side of the machine. All of our poll workers are 70 year-old middle-class women, which is a demographic heavily inclined to stare at my son regardless of what he is doing. I’m in VA – we look pretty clearly to be on our way to a Reep sweep. I think, when Dems are in office, voters notice how much they hate the Dems, and when Reeps are in office, voters notice how much they hate the Reeps. I voted this morning, for the candidate with the fewest iterations of the word “Christ” in his name, so that rule out Christopher Daggett, Christopher Christie, and, of course, Christo “ChristChrist” McChristerson. Other important considerations in my choosing a candidate were body mass index and quantity of facial hair. But, more importantly, in my County I got to vote for Kelly Ripa’s father for County Clerk. A corollary is that whenever a political party sweeps into office, they tend to believe that it’s forever (or at least good for a decade). I got to vote for Franco Harris’s son for mayor. I mailed my ballot today (just in the nick of time). We’re now an all mail-in voting state. We’re now an all mail-in voting state. Doesn’t that mean that you don’t get to find out who wins right away? If you mail it today, they obviously aren’t counting that ballot until tomorrow. Laura, I’ve been thinking about your remarks: I was rooting for Deeds and Christie – Deeds because I fear that McDonnell will dismantle some government services here in VA which seem to me to be provided well and appropriately, Christie because the Dems in NJ are so awful that the only thing I can think of that may redeem them is time in the wilderness. On the other hand, you are now looking at the likelihood that some gems may go out with the sludge, if Christie really does sluice out the stables. And maybe he won’t – as you point out, your Reeps are no prizes. People are really noticing Murtha, and Mollohan, and Dodd, etc., and not remembering Duke Cunningham or Tom DeLay. Here in VA, it does seem to me that the size of the swing has a lot to do with buyer’s remorse about Obama.